The kimono is the iconic traditional dress of Japan, with many different forms and variations. Its earliest forms date back to before the Heian Period (794–1192 AD), with the style most recognisable today having developed during the Edo period. 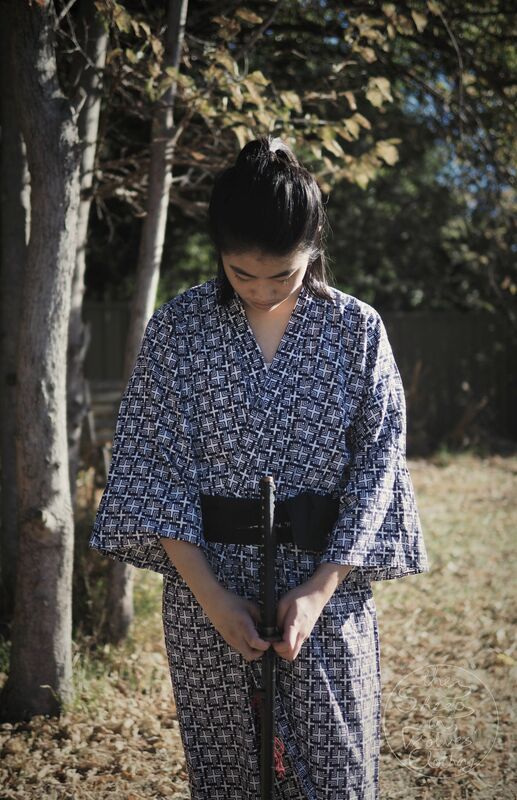 The kimono is traditionally cut from one piece of fabric and is characterised by its large sleeves, cross over front and tied waistband (obi). I cut my hair into a long bob early this year, which often require being pulled back in order to see/eat without chewing on my own hair. Upon pulling it up, I realised that I had WICKED AWESOME SAMURAI HAIR! We visited Malaysia for my brother’s wedding earlier in the year, where we visited by great-aunt who had not seen him for many years. She told my mother (in Cantonese) “Your son has very strong and fierce eyebrows; it’s good for warding off evil spirits.” Upon seeing my other brother and I the following day, she then remarked “Your children all have the same eyebrows, it’s very good.” With the help of a some brow pencils (I’ve never used it before), this fierceness was enhanced for the photoshoot. But yeah, apparently even in daily life my eyebrow game so strong that I can WARD OFF EVIL SPIRITS! At that point of time, I may or may not have started re-reading Rurouni Kenshin (including getting an early birthday present of the whole series…) and been writing (and still am) a novel about a samurai. And well, BEING INSPIRED IS GREAT! c) My sword grip needs much correcting! 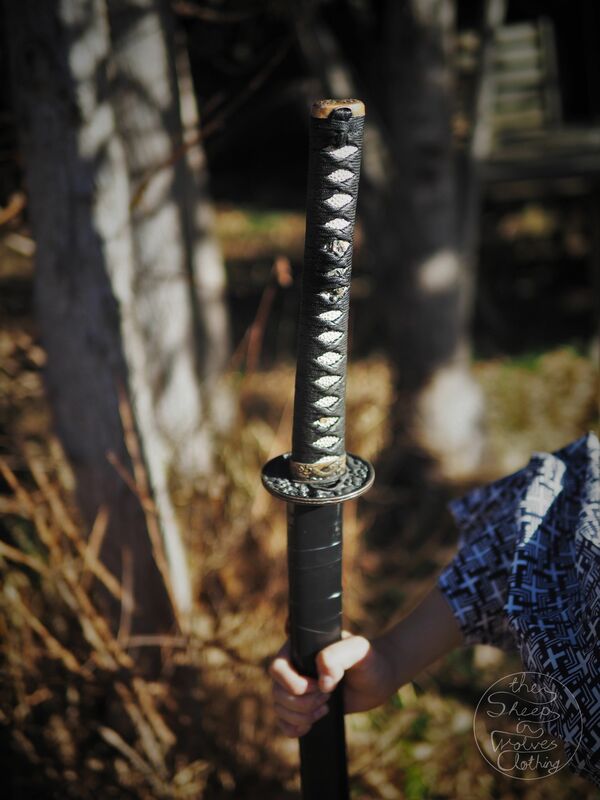 This is a good lesson in doing proper research; if I were wearing full body armour, hanging my sword blade-up is appropriate (for further reading, see: Samurai fashion guide- Should you wear your sword blade up or blade down?) I must admit, sometimes in the middle of a photoshoot it is easy to lose concentration and make mistakes such as leaving props in the background, having straps showing/clothes tags showing or in this case, carry your sword upside-down (*sigh*). In the end, I decided to include the photo in the collection anyway (since I didn’t have any better ones) but I will endeavour to do better next time! When I was a young teenager, I dressed up as a boy for a few parties/events on occasion. Chest binding was tricky then, but it is even harder as an older girl. I used elastic bandages and also bulked up my waist with cloth to form a more cylindrical silhouette. It was difficult however, and one must be careful not too excessively constrict one’s breathing. In terms of make up, I filled in my eyebrows to make their more striking and masculine. I also brushed a little foundation on my lips, to make them less red and feminine looking. Contouring to hollow out my cheekbones would have been enhance the look, but I have zero experience with that and decided to leave that for another time. 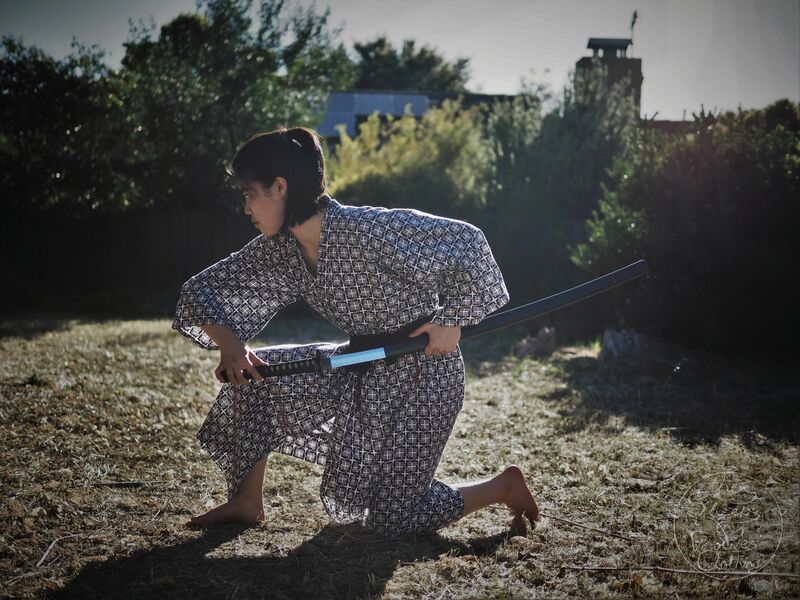 I would love to try kendo, get an authentic hakama or keikogi outfit (the clothing worn for practicing a variety of martial arts) and/or visit Japan.